On Saturday, I participated in my first bike “race.” To say that it was a “race” is not exactly accurate; it was a charity ride for Miles for Hope, an organization that “is dedicated to raising awareness, funding of cutting edge brain tumor research and clinical trials and to providing travel assistance to qualified patients. Through our work, we intend on finding not only treatments that provide a better quality of life for those suffering with brain cancer, but to find a cure for it.” Moving Towards a Cure, the name of Sunday’s event, included a 5 and 10K run/walk, and a 25, 50, and 100K cycle. 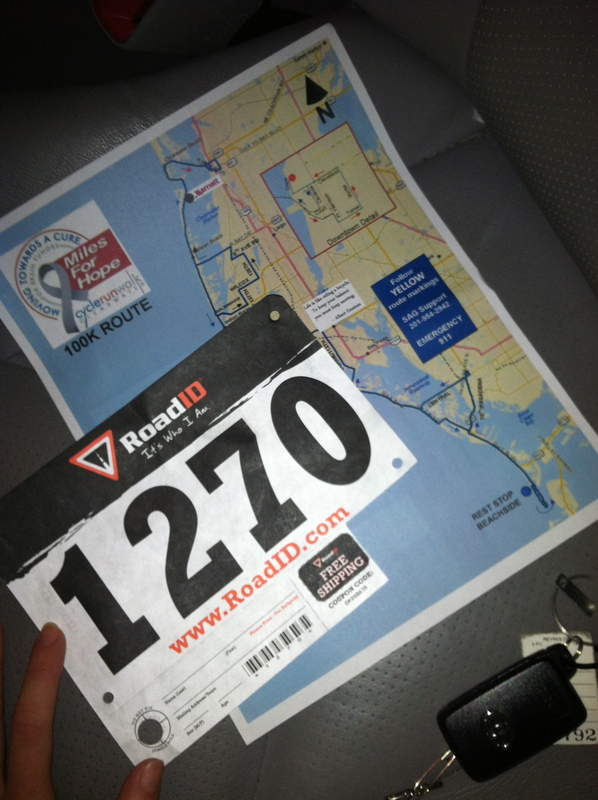 I got up bright and early to drive over to Clearwater’s Coachman Park, where I checked in and grabbed my race number and the map of the 100K course. I went back to my car to prep my bike and gather my nutrition. 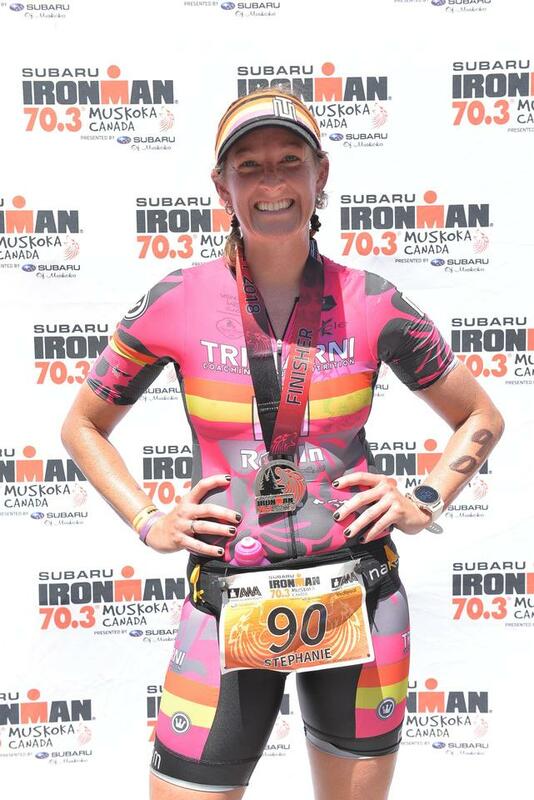 I didn’t really know how this whole thing worked-there was no cutoff to be out of transition, there was no pre-race meeting, and I didn’t have my normal pre-race jitters. People were just casually getting their stuff together and riding over to the start line. 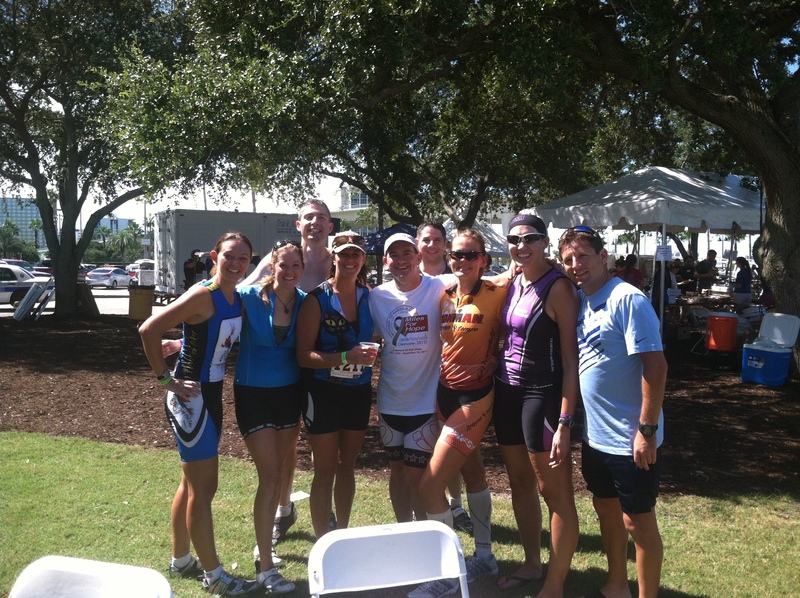 I had signed up with Team A-Train, a friend’s tri team, so I kept my eye out for some of them. 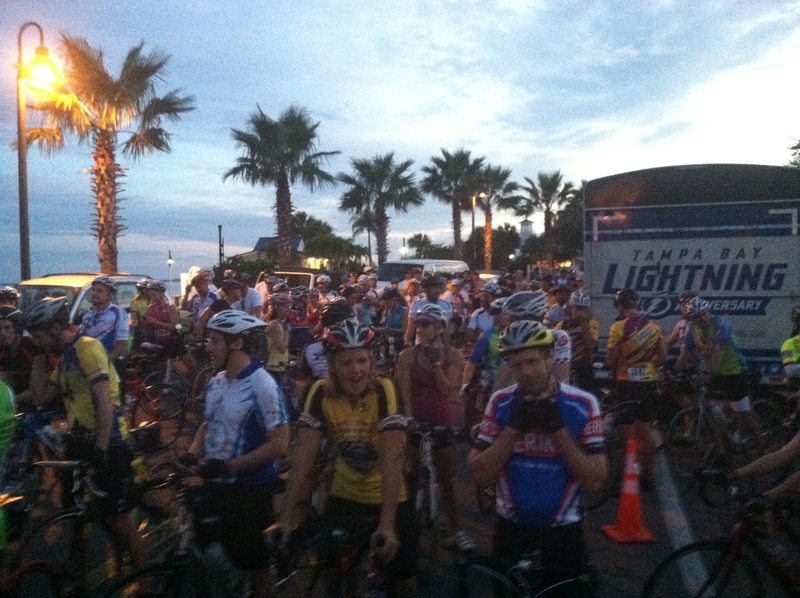 Soon, I spotted Beth and Nick, so we rode over to the start line together. 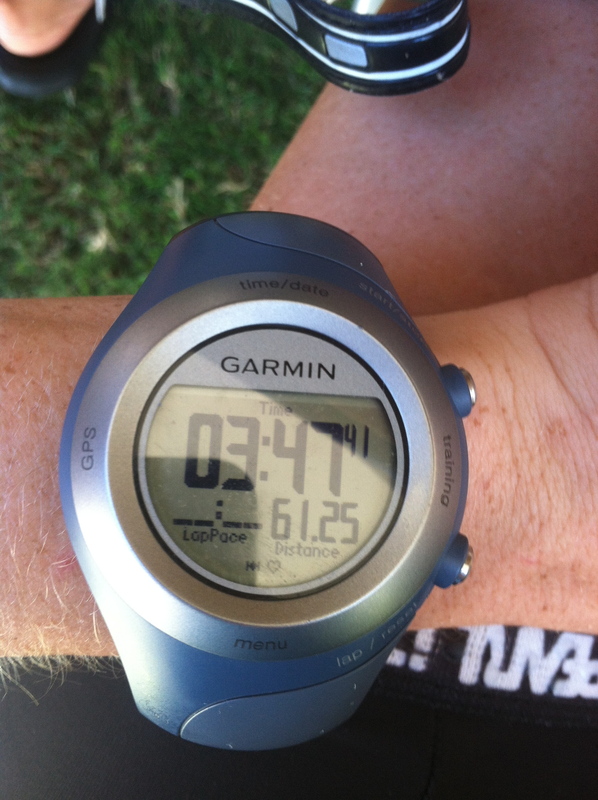 There were quite a few cyclists, but I had no way of knowing who was doing the 100K or who was doing the 25K. After a few minutes of waiting around (we had already missed the Star Spangled Banner; we could hear it when we were at the cars), they started all the cyclists. I was a little nervous because there were so many cyclists out of the gate, but everyone was really good at communicating “On your left!” “Car back!” and as far as I could tell, there were no crashes. I hadn’t studied the course all that closely, but I knew that I’d ride some of the bridges I ran with Meghann when I was marathon training. Shortly after we started, we crossed our first bridge. What a way to burn those legs right off the bat! 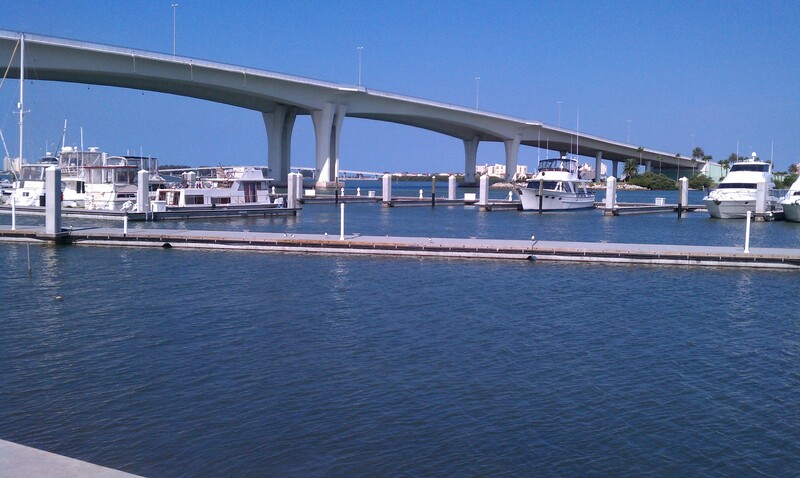 Once over the bridge, there’s a straightaway that takes you directly towards the beach. When you can’t go any further straight, there’s a traffic circle. For the race, there was a police man directing traffic on the circle. There were also little arrows painted on the ground, yellow, green, and orange, to indicate the different distances. The circle also had a sign on the grass with an arrow pointing to the right. When we got to the circle, I saw the sign on the grass first, so I had planned to go right. Unfortunately, the police officer told us to go left. Well, it’s pretty hard (and dangerous) to make a last minute decision to go one way or another, so I continued to go right, as the sign directed. I also saw a green arrow on the ground, and figured I must be going in the right direction. I was with a few of the A-Train team, but the rest of the group had gone left. We slowed down to figure out what to do. A few other cyclists went past us, and we tried yelling out to them to ask what distance they were going. None of them seemed to hear us, and sped on by. It was right about now that I wish I had brought that map, instead of leaving it in my car! Thankfully one of my teammates who had also gone right, brought her map. We checked it out, and realized that the green arrows weren’t for the 100K. We needed to follow the yellow arrows. So, we turned around and got back on track. Pete, our fearless leader, was waiting for us just on the other side of the circle. 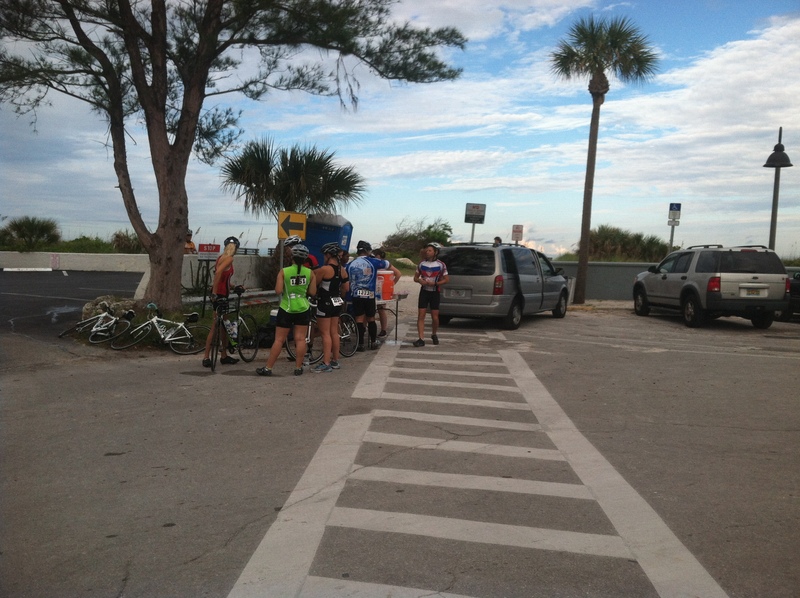 The rest of the group was way far ahead, but we figured we’d all catch up at the rest stop. 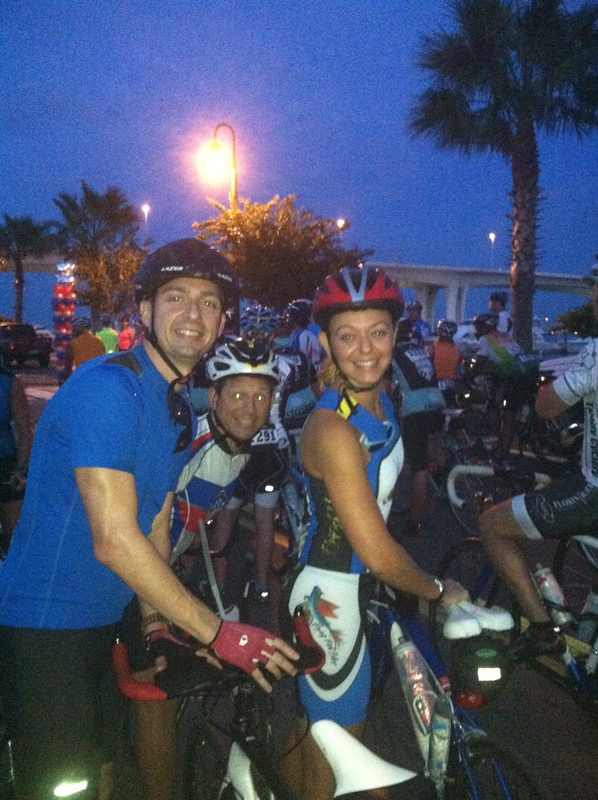 The four of us, Pete, Brad, me and Miranda rode together for the 30 miles until the turnaround. As expected, the rest of our group was waiting for us there! I grabbed a chocolate chip cookie and refilled my water bottle before we hit the road again. 10 miles or so after the turnaround, we powered through a bridge. On the other side, we took a head count and realized we were missing one of our teammates. Someone said they had seen him on top of the bridge, looking like he had started to cramp up. So, we stopped, and two guys went back to see if he was okay. A few minutes later, the three of them returned. The missing teammate had cramped up on the bridge, and had to stop. Before we started up again, someone gave him two packets of mustard. I was really confused, but apparently mustard packets are a super quick cure for muscle cramps (as is pickle juice)- who knew?! Within a few minutes of starting back up on our ride, his legs were feeling better! 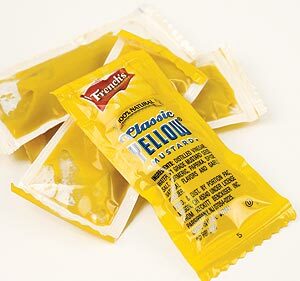 Mental note- snag a few mustard packets next time I’m at a ball game! The rest of the ride back was pretty uneventful; we stayed together as a group, chatted about life, and just enjoyed being out on this beautiful day! I really appreciated the team aspect of this event; I loved that we stayed together and made sure everyone was doing okay. 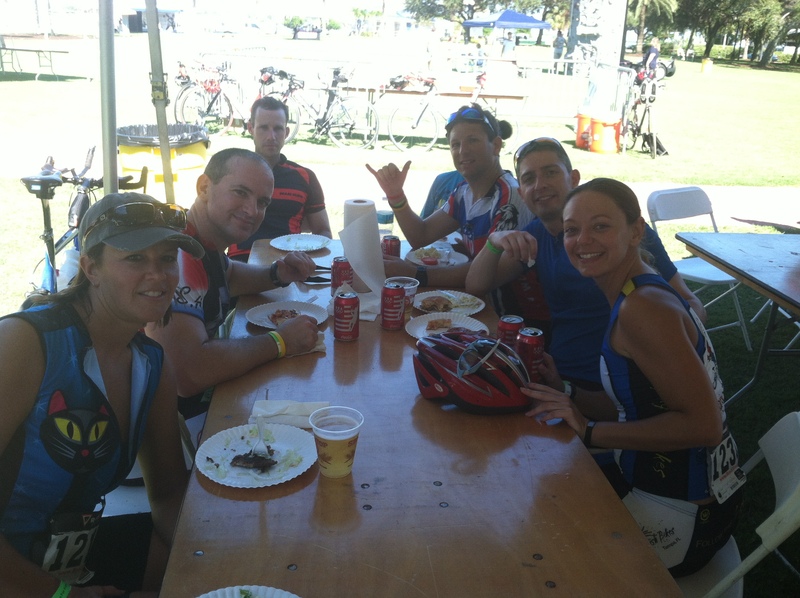 Less than four hours after starting the ride, we crossed the finish line! It was a little anticlimactic, as many of the runners and other cyclists had already finished and cleared out hours before. My first thought was actually, Wow, are we the last ones? 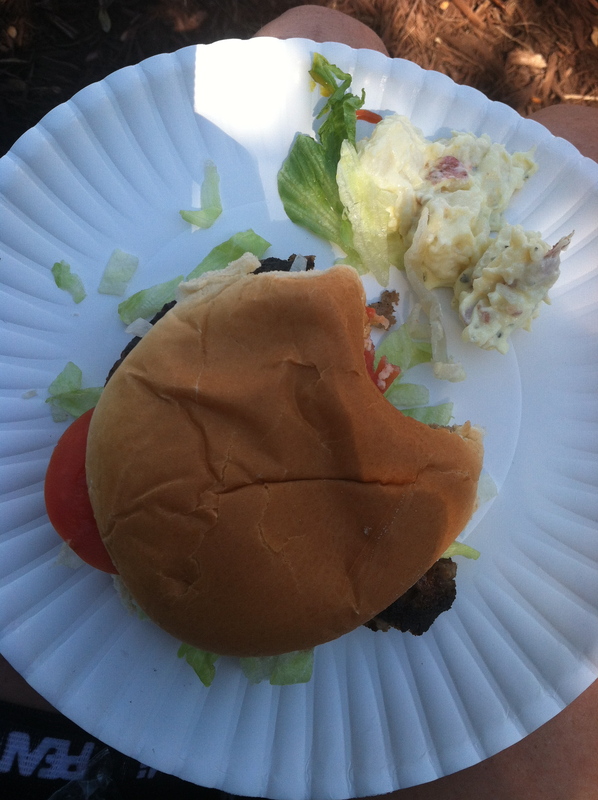 Burger and potato salad, with a coke. 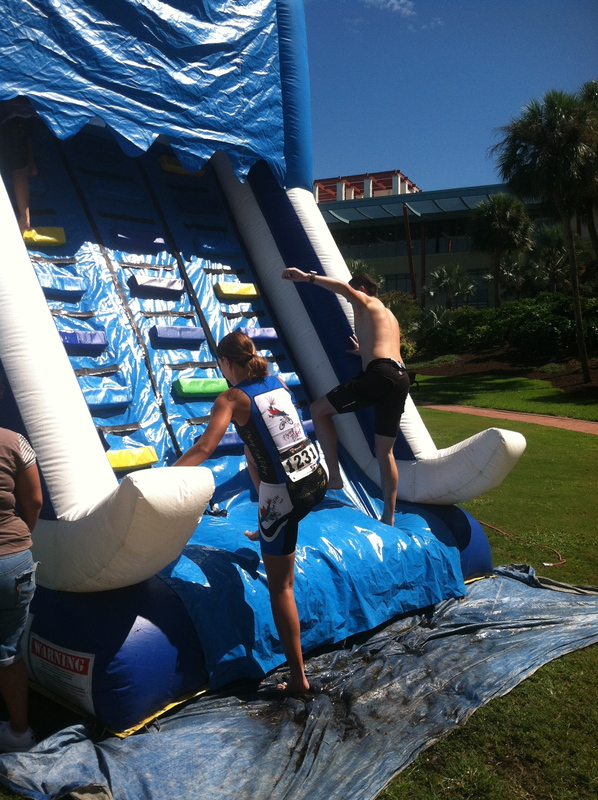 Oh, and I can’t forget about the post race (kids) entertainment! Overall, it was a great day. The weather was perfect, I had great people to ride with, I was riding for a great cause, and I didn’t have any nutrition problems. I guess I could have hoped for a little clarity in directions, but I guess in a ride like this, the onus is on the riders to know where to go, and not volunteers at every turn. But, lesson learned, and I can’t wait to do another one! 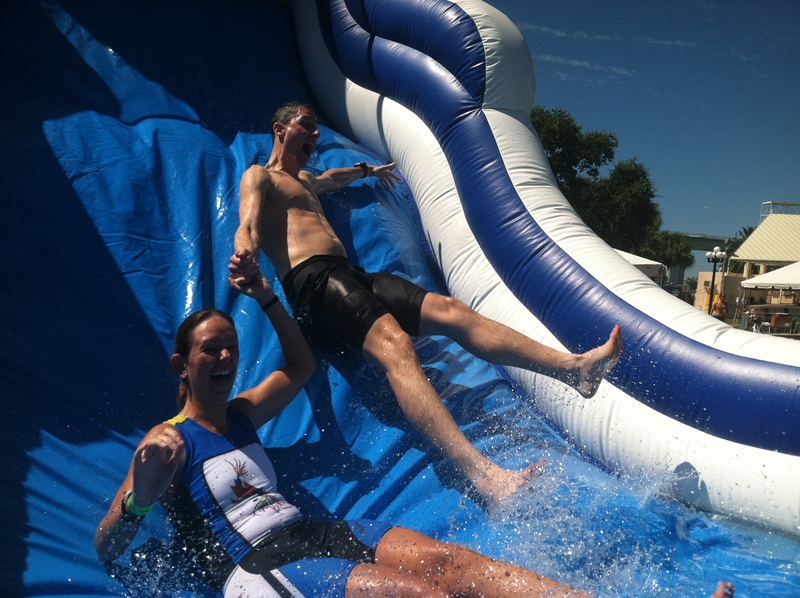 Question of the Day: Have you ever done a charity ride? Oh wow, mustard! That makes a lot of sense! I’m going to snag those for myself too!! Great tip! I’ve heard the mustard trick before but luckily haven’t had to use it! I guess it’s the high salt content that makes it work on cramping legs. 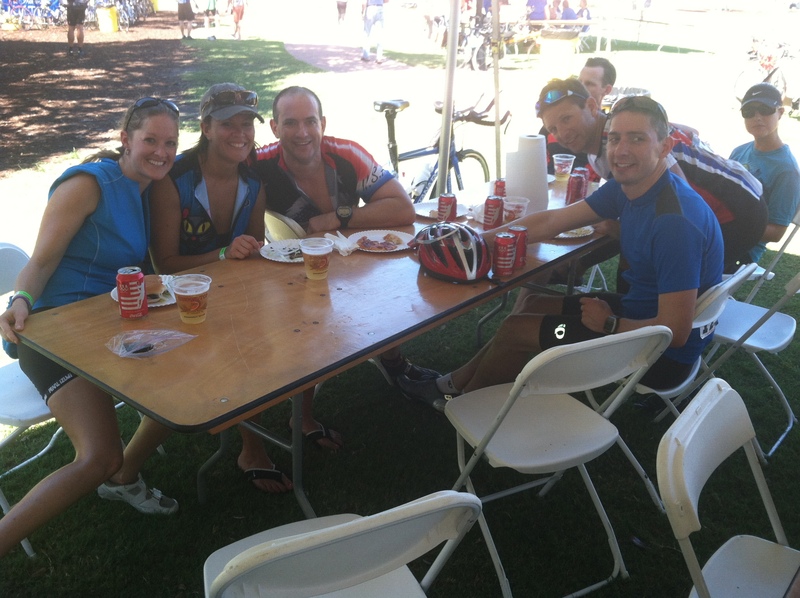 I’ve done one charity ride before, the BikeMS/MS150. It was a really neat experience! Yeah, I read it was also the acetic acid, and turmeric is very good for you too! I definitely want to do another one of these rides! Truly a great day.. glad you could be a part of it with the team! Thanks for being such a great team leader! Thank you for participating in our event! 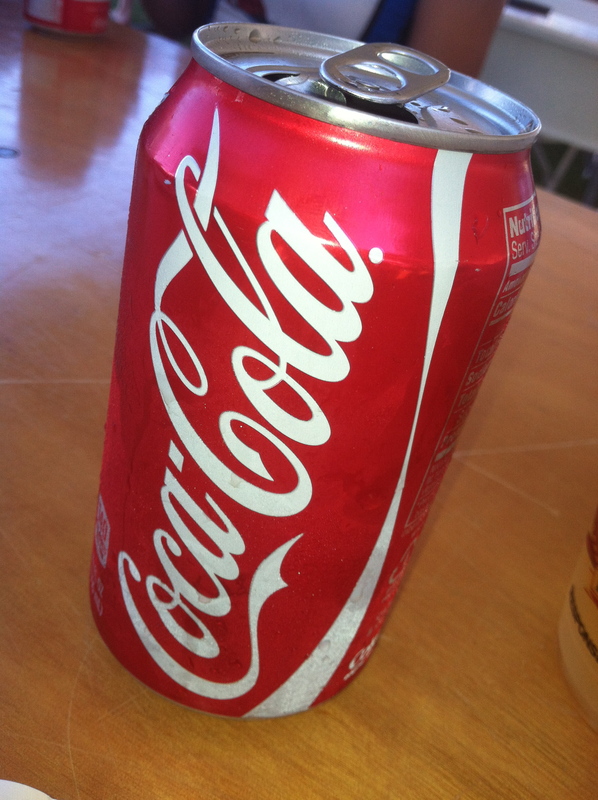 I love the blog. It is nice to see our efforts in the view of our participants. I am glad you and your team had fun! We hope to see you all again next year. Thanks for reading! Great event! I plan on coming back! Nice to meet you too! I will check out your blog! I’m assuming that the mustard trick works for running too? That’d be easy to carry with you on a long run. Congrats on the finish. Amazing amount of miles! Yeah, I would think so! Just the thought of sucking down a packet of mustard grosses me out!